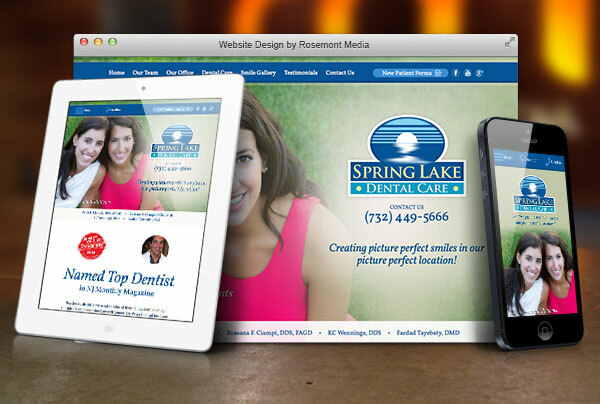 Dr. Peter Ciampi recently teamed with Rosemont Media to create a responsive dental website for his practice, Spring Lake Dental Care – and the results speak for themselves. The site incorporates some of the latest stylistic flourishes and has a mechanical design that makes it possible for viewers to access it across a range of devices – including desktops, smartphones, and tablet computers – without losing the depth of content or the ease of navigation. The website includes detailed biographies of Dr. Ciampi and his fellow New Jersey dentists, in addition to comprehensive descriptions of cosmetic dentistry and general dentistry procedures. Plus, the website is equipped with a before-and-after smile gallery, patient testimonial videos, a News Room compiling the practice’s published press releases, and much more. Photos of actual patients are also built into the design, so the top images on multiple pages showcase beautiful shots of treatment results experienced by individuals at Spring Lake Dental Care. Dr. Ciampi’s website uses some of the latest dental SEO and content strategies to help him maintain high positions in search rankings, and the site’s narrative is designed to be educational without being overwhelming. We are so proud to have worked with Dr. Ciampi on this stunning new site that offers patients a user-friendly and informative look into Spring Lake Dental Care. We welcome you to view Dr. Ciampi’s new website at www.springlakesmiles.com. If you would like to see how you can enhance your practice’s online profile, please contact Rosemont Media today.